Right To Farm Amendment: Oklahoma 2016? Missouri 2014! North Dakota 2012! #‎Cockfighting‬ ‪#‎Passion‬ is ‪#‎Gamecock‬ ‪#‎Farming‬, ‪#‎Sports‬, & ‪#‎Industry‬. #‎BeSecular‬ ‪#‎VoteChoice‬ ‪#‎StopOppression‬ ‪#‎LegalizeLiberty‬ ‪#‎ForHumanRights‬ ‪#‎ForHumanity‬. Three States in a Row for Right to Farm? Oklahomans will decide as part of the November general election whether to add a right-to-farm amendment to their state constitution. It’s the third time since 2012 the idea has been tested at the state level. North Dakota approved a right-to-farm amendment in a 2-to-1 landslide in 2012, and Missouri approved its amendment by a razor-thin margin in 2014. Mainline farm groups, ranging from the state Farm Bureau and Oklahoma Cattlemen’s Association to retailers and farm suppliers, support the amendment as a line of defense against “deep-pocketed animal rights groups” and other outsiders who would restrict farm and ranch operations. In an appeal to urban voters (66% of the population), umbrella group Oklahoma’s Right to Farm says the amendment, Question 777, will hold down food prices by letting farmers and ranchers decide which production methods work best for them. Jeff Jaronek of the Oklahoma Cattlemen’s Association says the amendment would provide “one more layer of protection for family farmers. It’s the small guys, the family farms that can’t survive overregulation.” The campaign hit the ground early, sending speakers to service club luncheons and other gatherings. In July, it began shipping 4×8-foot roadside signs saying Yes on 777. Opponents, such as former state attorney general Drew Edmondson, say the amendment is so broadly written that it would legalize puppy mills and create a barrier to antipollution laws. “This constitutional amendment is a threat to public water-supply systems both from a quality and quantity perspective,” says Choctaw Mayor Randy Moss, speaking for the Oklahoma Municipal League. Other opponents include animal welfare groups, the Sierra Club, and the Humane Society of the United States, which has pushed state referendums against sow crates, veal-calf stalls, and battery cages for laying hens. Massachusetts will decide a citizen initiative on farm animal confinement on November 8. Nebraska state senator John Kuehn shelved a right-to-farm constitutional amendment at the end of the session in Lincoln. He says he needed more time to educate urban lawmakers and will try again next year. In June, North Dakotans voted to keep their constitutional ban of corporate farming, dating from the Depression. The referendum overturned a 2015 law allowing corporate hog and dairy farms of up to 640 acres. Three Months Out- Supporters of Right to Farm Have a Half Million Dollar War Chest- Will That Be Enough? There are three Political Action Committees that have filed paperwork with the Oklahoma Ethics Commission with announced intentions to support or oppose State Question 777, Right to Farm. Oklahoma Farmers Care SQ777 is the entity that was created almost a year ago to support the State Question as it appears on the November General Election ballot, and The Oklahoma Stewardship Council and Oklahoma Food Farm and Family are two PACs set up to oppose the State Question. The Oklahoma Farmers Care group has now filed four quarterly reports and those reports show that a total of $816,540 has been raised in cash and in kind to date in favor of the State Question. A little over $200,000 has been spent to date, with the campaign spending money for bumper stickers, roadsign signs, website and social media to this point. No money has been spent for radio, TV or Billboards to date. The latest report shows a total of $586,726 is in the bank, which supporters have ready to use to respond to the expected media blitz to come by opponents of Right to Farm between now and election day. The contributions have been spread almost equally over the four reporting periods, with total contributions showing $165,099 being given in the third quarter of 2015, $245,485 given in the fourth quarter of 2015, $219,827 given in the first quarter of 2016 and $186,129 given in the second quarter of 2016. A significant amount of the money has been given by individuals- approximately $95,000 has been contributed by mainly people identifying themselves as farmers and/or ranchers. The grassroots extends to County Farm Bureau groups, with at least ten County Farm Bureaus giving $10,000 or more on behalf of the members of their county. Counting contributions of less than $50, over 200 individual farmers and ranchers have invested in the campaign to date. Of the groups, organizations and companies that have made contributions- the Oklahoma Pork Council is single largest listed entity, with Oklahoma Farm Bureau Insurance and a collection of Farm Credit Associations also giving susbtantial amounts. Click here for the part of the Ethics Commission report where you can find the actual reports for Oklahoma Farmers Care. Looking at the groups that oppose State Question 777, the Oklahoma Food, Farm and Family group appears to be tied closely to the Oklahoma Municpal League and in the single report they have filed, show a contribution from Oklahoma Rising, Inc that totals $177,530. Most of that money has been spent- apparently in organizing in anticipation of having more money flow in this quarter to spend in media buys telling Oklahomans to vote no. This group has reported a Billboard expendicture to date of $26,650 for their “NO” message. The only other contribution that this group received besides the one already mentioned comes from Kirkpatrick Bank for $1,500. No individuals have given them money. As for the Oklahoma Stewardship Council, they have collected in cash and in kind total contributions of $90,748 to date. Of the 47 individuals listed in the reports filed with the Ethics Commission, there are no farmers or ranchers or anyone directly involved in the agricultural community that have given money. The largest hunk of money and in kind gifts have come from HSUS- $40,568 coming from the organization based in Washington, DC. The largest single individual donor to the Stewardship Council is Christian Keesee of Oklahoma City. Keesee is the chairman of Kirkpatrick Bank and Kirkpatrick Oil & Gas Company. Mr. Keesee also leads two philanthropic organizations as chairman of the Kirkpatrick Foundation and president of the Kirkpatrick Family Fund, both based in Oklahoma City. He also is a board member of the Humane Society of the US. Counting his personal contribution and the in kind gifts of the companies he is Chairman of- over $25,000 has been provided to campaign against State Question 777. It is widely expected that the Humane Society will send a large amount of money this quarter to the Stewardship Council to allow them to buy media ahead of the November general election. The Director of the Council, former attorney general Drew Edmonson, told Radio Oklahoma Ag Network Farm Director when they kicked off the campaign last fall that he would anticipate a million dollars or more might be spent on each side of the debate. In addition to the three entities that have filed reports with the Ethics Commission, several proponents of State Question 777 question the influence of Keesee as Chairman of the Foundation Board on the efforts being made by the Kirkpatrick Foundation in their educational campaign on Right to Farm. The Kirkpatrick Foundation has been aggressive in a campaign they have tagged “Know Before You Vote.” According to the Kirkpatrick Foundation website, “Our goal is to educate Oklahomans about what would happen if SQ 777 passes this fall.” Click here for their lead in page that has several links they have created on State Question 777. Why Does Right To Farm Matter? Why should anyone who doesn’t farm or ranch care about Question 777, the Right To Farm amendment? Simple, because each and every one of us relies on agriculture to feed us, clothe us, and drive our economy. In Oklahoma, there are 80,000 farms and ranches, 98% of which are family owned and operated. That may seem like a lot, but they’re responsible for helping to feed the nearly 4 Million people in Oklahoma, and hundreds of millions across our nation and the globe. With an exploding population, comes increasing demand. Today, food prices are steadily rising and as many as 26% of Oklahoma’s children struggle with food insecurity. The burden on our farmers has never been higher. It’s a job that gets harder everyday. A smaller percentage of our population is farming than ever before, and they’re being forced to produce more food on less land, using fewer resources. Constant interference from government bureaucrats and anti-agriculture activists drive farmers out of business and severely limit the productivity of others. The issue goes well beyond just food. Oklahoma’s farmers contribute more than $8 Billion to the state’s economy and support tens of thousands of jobs. Now is the time to stand up, and defend those hard-working family farmers and ranchers that do so much for us. Right To Farm will shield them from needless red-tape, and attacks from out of state special interests. That way, they can do what they do best: Grow great tasting, nutritious food we can all enjoy…and afford. Sign up today and help pass Question 777, the Right To Farm amendment. Oklahoma’s farmers and ranchers are energized and excited about the Right To Farm amendment. If passed, Oklahoma will join a growing list of states, including Missouri and North Dakota, that are taking steps to protect the hard working families that grow our food and our economy. However, we know people have questions about what a Right To Farm amendment will do, and why it’s needed. We’ve provided in-depth answers to some of the most frequently asked question right here. Also, be sure to sign up for our email alerts to learn more about the campaign and how it’s progressing. Don’t forget to follow us on Facebook and Twitter to join in the conversation as well. To download a pdf of the official ballot question, click here. 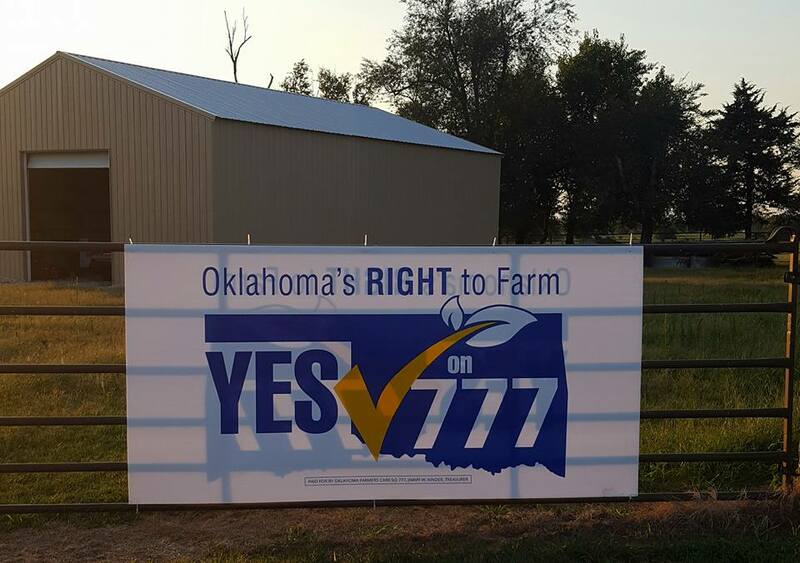 Oklahoma’s Right to Farm constitutional amendment will be on the ballot in 2016. To secure these constitutional rights for farmers and ranchers, Oklahoma agriculture needs to make our case to the press and the voters. Below are Frequently Asked Questions (FAQs) and talking points to better prepare our member-leaders for the campaign. The central theme to keep going back to (if you get a question you can’t answer, that’s fine just say so and steer back to this) is that the Right to Farm protects family farmers and ranchers and ensures that we can pass on our farms to the next generation. We are asking Oklahoma voters to support the family farmers that are leading the charge on the Yes on Right to Farm campaign. Fellow farming and ranching states like North Dakota and Missouri have already passed Right to Farm constitutional amendments in 2012 and 2014, respectively, and Oklahoma has the opportunity to be a national leader in this movement. The central question from outside of agriculture is what is Right to Farm and what will it do? Q: What is Right to Farm? A: Right to Farm is a state constitutional amendment to protect family farmers and ranchers. It also protects consumer choice. This amendment is being supported by farmer-led organizations because agriculture is the lifeblood of rural Oklahoma’s economy and a deeply held part of Oklahoma’s heritage. Family farmers and ranchers work hard to pass their farm on to the next generation and Right to Farm will help ensure that transition to the next generation by giving farmers and ranchers another “tool in their toolbox” to defend themselves from unwarranted laws and regulations in the future. Q: What will Right to Farm do? A: Right to Farm will give farmers another “tool in their toolbox” to defend themselves from unwarranted laws and regulations, including ballot initiatives funded by deep-pocketed animal-rights groups. Right to Farm will not throw out scientifically-based rules and regulations as every right is subject to reasonable regulation and Oklahoma’s farm and ranch families are committed to upholding all laws and regulations pertaining to agriculture. Moreover, by guarding against overly restrictive laws and regulations that limit the ability of Oklahoma farmers and ranchers to decide what production methods work best for them, Right to Farm will assure consumers that Oklahoma farmers and ranchers can provide the choices they want in food and fiber. Oklahoma’s courts will ultimately determine the scope of Right to Farm, but this amendment gives farmers and ranchers a degree of protection that they do not have now and that they need for future protection. Costly ballot initiatives that promote unreasonable and unnecessary laws and regulations are designed to drain agriculture’s resources and mislead the public. The same well-funded animal rights groups opposing Right to Farm have run ballot initiatives targeting agriculture across the country and Right to Farm protects our farmers and ranchers before these extreme groups can make Oklahoma a target. Q: What will be different if Right to Farm passes? A: If voters approve the Right to Farm, farmers and ranchers will have additional constitutional protections that they currently lack, and need. Right to Farm will be another “tool in the toolbox” for Oklahoma farmers and ranchers to defend themselves against future laws that could directly jeopardize their ability to farm. While the courts will ultimately decide the scope of Amendment 1, past attacks on agriculture have proven that Oklahoma agriculture needs Right to Farm as a first line of defense. Q: Right to Farm seems like commonsense. Who opposes this and why? A: Animal rights groups, led by the Humane Society of the United States (HSUS) have opposed the Right to Farm movement because these constitutional protections would hinder their plans to target agriculture at the ballot box through misleading ballot initiatives. HSUS has spent tens of millions to target everything from egg farming in California to deer hunting in North Dakota and they oppose Right to Farm because they oppose farmers, ranchers, hunters, and all meat eating. Q: Who benefits from the Right to Farm? A: Small farmers, hobby farmers, family farmers, organic farmers, and all farmers and ranchers benefit from the Right to Farm. The Right to Farm will protect all farmers equally and family farms will especially benefit as they do not have the resources to relocate or fight off well-funded anti-agriculture groups that have used the initiative petition process in many states to target agriculture. Q: Why do we need the Right to Farm in Oklahoma’s state constitution? A: Some extremist groups have targeted agriculture in recent years and now farmers are supporting the Right to Farm amendment to provide long-lasting legal protections for their way of life and for the economic base of rural Oklahoma. Q: Does this amendment give farmers and ranchers a “blank check” to do whatever they want? A: Every right is subject to reasonable restriction. Just as we can’t shout “fire” in a crowded building, farmers will not have a blank check under the Right to Farm amendment. State and federal regulations that are in place will not be superseded by the Right to Farm amendment.